Your participation in the completion of community achievements will be rewarded with gifts and giveaways for you and all players who participated. You should encourage everyone to participate to get the rewards faster and make better rewards available. We must reach the current objective of Subscribers on YouTube to unlock the related rewards. We must reach the current objective of views on YouTube to unlock the related rewards. Due to the completion of the Forum Users' achievement, 50 Vote Points will be dispatched to each account and the users achievement goal has been increased to 200! Due to the completion of the Youtube Trailer Views! The amount of views required in order to unlock more Vote Points has been increased to 1500! The vote points have been dispatched to your accounts! Added a new Community Achievement ''Facebook Trailer Shares''. In order to complete this achievement and win 100 Vote Points, you have to share the trailer in your facebook walls. Once we get 50 shares, the points shall be dispatched toward your accounts. Any further information in regards to the Community Achievements will be given by @Alex (me) or @Claus. A HUGE thanks to everyone!!! 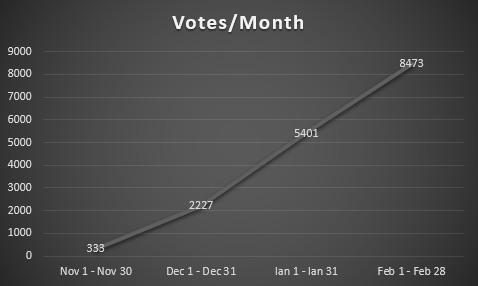 As a token of appreciation, we have added 10 DP's to each account who has voted (at least once) since November the 1st. Due to reaching over 1500 Views on the YouTube trailer 100VP was given out to every existing account.